Original 1936 Swint Time Two Sheet Movie Poster. Poster is in fair/good shape. Poster measures 41x54 This is a must own for any collector. Please check out my other items for sale. Important Added Info: Note that this poster was printed by the Globe Printing Company. This was a company like the "other company", which printed their own posters for major movies in the 1930s, for use by theaters that (for one reason or another) had trouble getting posters directly from the studios. When National Screen Service took over most poster distribution in 1940, these companies went out of business. The poster is fragile and there are tears and some paper loss at some crossfolds, in parts of some foldlines, and in parts of the borders. 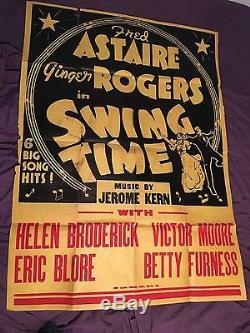 The item "Original RARE Swing Time 1936 Two Sheet Movie Poster Fred Astaire Ginger Rogers" is in sale since Saturday, October 22, 2016. This item is in the category "Entertainment Memorabilia\Movie Memorabilia\Posters\Originals-United States\Pre-1940". The seller is "godzilla8it" and is located in Highland, Indiana. This item can be shipped to United States, Canada, United Kingdom, Denmark, Romania, Slovakia, Bulgaria, Czech republic, Finland, Hungary, Latvia, Lithuania, Malta, Estonia, Australia, Greece, Portugal, Cyprus, Slovenia, Japan, China, Sweden, South Korea, Indonesia, Taiwan, South africa, Thailand, Belgium, France, Hong Kong, Ireland, Netherlands, Poland, Spain, Italy, Germany, Austria, Israel, Mexico, New Zealand, Philippines, Singapore, Switzerland, Norway, Saudi arabia, United arab emirates, Qatar, Kuwait, Bahrain, Croatia, Malaysia, Brazil, Chile, Colombia, Costa rica, Dominican republic, Panama, Trinidad and tobago, Guatemala, El salvador, Honduras, Jamaica.